Belgian police have discovered over a ton of cocaine worth more than €50 million, with the packages floating in the sea off Ostend. Sixteen large packages were found by a fishing vessel about 20km from the Belgian coast. Police believe the cocaine was being shipped from South America on board container ships, and was dropped into the sea. It’s thought that drug traffickers on land would then sail out in small boats to fish the drugs out of the sea. The finding represents the new tactic by drug dealers to smuggle narcotics into Europe. "As the chance of getting caught in the ports increases, criminals are trying out other, sometimes novel, methods in order to avoid the classic controls. More and more traffickers are trying it and this is a growing phenomenon with us," Belgian magistrate Ken Witpas told the local daily Het Nieuwsblad. 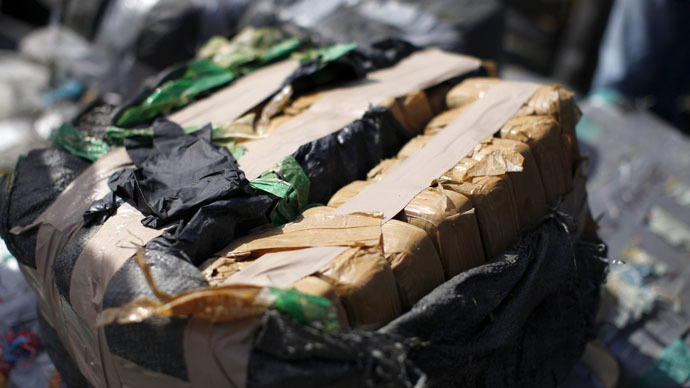 In December and January respectively, 1,200 and 800kg of cocaine were found off the same coast. Drug traffickers often take to unconventional methods of smuggling: since 1993, custom-made narco-submarines have frequently been used by Colombian cartels to transport drugs to Mexico, and then to the US. Also, just over a month ago, nearly 3kg of meth literally fell from the sky in the town of Tijuana, Mexico: a drone carrying the substance crashed into a supermarket parking lot.